The Film Foundation and American Express kicked off the second year of their Preservation Screening Program in September 2008 at the Boston Film Festival and the Calgary International Film Festival. The Film Foundation and American Express welcomed the Boston Film Festival to the Preservation Screening Program and launched the program’s second year with a screening of THE BAREFOOT CONTESSA (1954, d. Joseph L. Mankiewicz), from the program’s “In Glorious Technicolor” series. The film screened at the Coolidge Corner Theatre in Brookline, MA on September 15th. 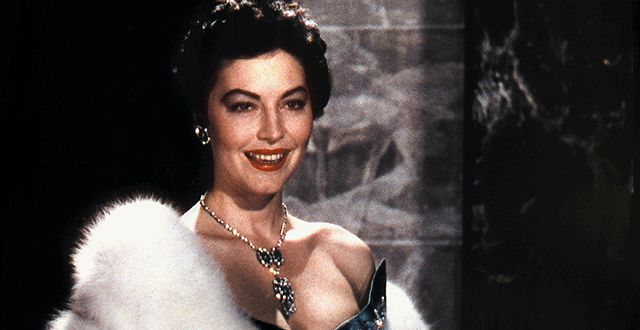 Released in September of 1954 by Figaro, Inc. and United Artists, THE BAREFOOT CONTESSA follows the meteoric rise of Spanish dancer Maria Vargas, played by the captivating Ava Gardner. Her story is narrated by the three men who knew her best, beginning with the movie director who discovered her (Humphrey Bogart); Edmond O’Brien as the press agent who guided Maria’s progress through café society; and finally the Italian count (Rossano Brazzi) who, by marrying Maria, made her a contessa. The film was preserved by the UCLA Film & Television Archive in cooperation with MGM Studios, with funding provided by The Film Foundation and Robert B. Sturm. In its second year at CIFF, the Preservation Screening Program brought two more feature films to the historic Plaza Theater: LEAVE HER TO HEAVEN (1945, d. John M. Stahl) and ONCE UPON A TIME IN THE WEST (1968, d. Sergio Leone). John M. Stahl’s classic LEAVE HER TO HEAVEN, from the program’s “In Glorious Technicolor” series, screened on September 20th. The film was restored by the Academy Film Archive in cooperation with Twentieth Century Fox, with funding provided by The Film Foundation. On September 21st, Paramount’s Barry Allen introduced Sergio Leone’s ONCE UPON A TIME IN THE WEST and talked about the technical aspects involved with the restoration of this Western epic. This film was restored in 2007 by Paramount in association with Sergio Leone Productions. Funding was provided by The Film Foundation and the Rome Film Festival. On October 10th, the 46th New York Film Festival unveiled the World Restoration Premiere of PANDORA AND THE FLYING DUTCHMAN (1951, d. Albert Lewin) at the Walter Reade Theater in Lincoln Center. Martin Scorsese, Founder and Chair of The Film Foundation introduced the film alongside Kent Jones from the Film Society of Lincoln Center. The film was restored by George Eastman House, in cooperation with The Douris Corporation, at Cineric, Inc. in New York City. After an exhaustive worldwide search, no original negatives could be found. Working from separation master positives created in 1951, the film was restored photochemicallyusing the Cineric Single Pass System to re-register the color records and manufacture timed separation negatives. Sections of the film were scanned 4K resolution to perform digital dirt and scratch removal. Additionally, the soundtrack was fully restored by Audio Mechanics in Burbank, California. Funding was provided by The Film Foundation, the Franco-American Cultural Fund, and the Rome Film Festival. The Preservation Screening Program brought New American Cinema classic FACES (1968, d. John Cassavetes), and a special screening of ONCE UPON A TIME IN THE WEST (1968, d. Sergio Leone) to the historic Music Box Theater. On October 26th, FACES screened with introductions by Heather Herbert of American Express and UCLA Film & Television Archive’s Ross Lipman. Lipman presented a before-and-after restoration showcase that incorporated clips from both Cassavetes’ SHADOWS (1959) and FACES. On October 28th, the restored ONCE UPON A TIME IN THE WEST made its Chicago premiere.